Vivo X23 Specifications Leaked to Confirm Camera Configuration and Battery Capacity - Playfuldroid! The Vivo X23 is launching on Sept. 6. Its dedicated page on the official website of Vivo China have already some of its key features. However, some details such as camera configuration and battery capacity have remained under the wraps. A fresh leak that seems to show a snapshot of an internal presentation of the smartphone has appeared. 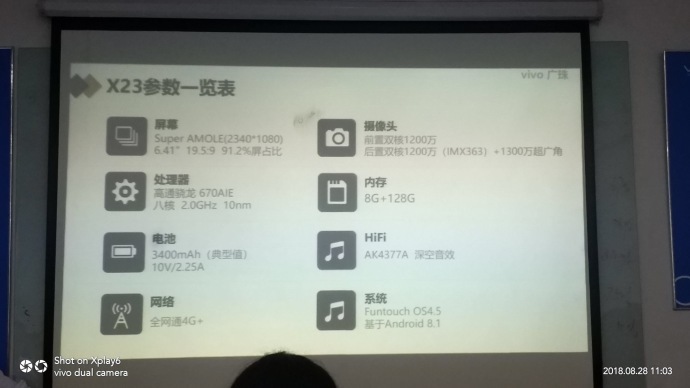 The screenshot has revealed all the key specs of the phone. The below image reveals that the Vivo X23 features a 6.41-inch Super AMOLED screen that supports Full HD+ resolution of 2340 x 1080 pixels. The handset that features a smaller notch than the predecessor X21 smartphone offers a screen-to-body ratio of 91.2 percent. Vivo has already confirmed that it will be arriving with fourth-generation in-display fingerprint scanner. For photography, it features 12-megapixel selfie camera and 12-megapixel Sony IMX363 + 13-megapixel dual camera setup. It is preloaded with FunTouch 4.0 OS flavored Android 8.1 Oreo OS. The 10nm Snapdragon 670 AIE chipset that includes 2.0 GHz octa-core processor powers the smartphone. The SoC is coupled with 8 GB of RAM. It has a native storage of 128 GB. The handset will be fueled by 3,400mAh battery that supports 10V / 2.25A charging. It also features AK4377A audio chip. As of this writing, there is no information available on the pricing of the Vivo X23.